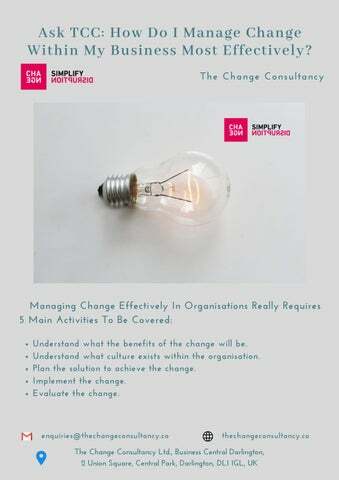 Managing Change Effectively In Organisations Really Requires 5 Main Activities To Be Covered: Understand what the benefits of the change will be. Understand what culture exists within the organisation. Plan the solution to achieve the change. Implement the change. Evaluate the change. Letâ&#x20AC;&#x2122;s take a look at each of these steps in a bit more detailâ&#x20AC;Ś Do Not Implement a Change Before You Understand its Benefits. No change should ever be delivered without understanding what benefits will be rendered. The benefits will always be varied depending on the audience. For instance, letâ&#x20AC;&#x2122;s consider a lightbulb that will be used as it is lower cost and even has a brighter glow. A business owner will be focused on long term potential to cost savings, whilst a staff member will potentially be more interested in whether this will affect their eyes. In fact, most changes will focus on reduced costs, increased margins & fewer man hours, which will always be good for the people pulling the strings. However, the benefits to the majority of staff will not always be made clear. The main area to focus on is the personality of the organisation: What are they trying to achieve (Vision, Mission, Focus)? What are the behaviours they demonstrate (Belief, Values)? Be wary though. Most organisations will have this worked out, but there is likely to be a large disconnect from what is advertised. So letâ&#x20AC;&#x2122;s go back to our example of a lightbulb and consider that the organisation is going to change the lightbulbs in the organisation as it saves the business owner money. What will be the likelihood of the staff all embracing the change and cheering it forward? Low to none right? Ok so, now letâ&#x20AC;&#x2122;s start to imagine an organisation who is all about family values and supporting more families as they grow, and everyone is really bought into the behaviour to achieve this. Does this make it easier to start to begin to think about how to get people on board? It should, if you start crafting all language around something like a universal lightbulb change in an organisation and start to align it to the fact with reduced costs weâ&#x20AC;&#x2122;d be able to look at the increased opportunity for growth and supporting more families. Now if you pose the question around likelihood of adopting the change enthusiastically, has it increased? I hope so. Plan the Change with Project Management We know what is changing â&#x20AC;&#x201C; check. We understand the organisation â&#x20AC;&#x201C; check. So we know what is changing and we understand the organisation, now planning the change should be easy. To take it further, it requires standard project management skills to progress. Document everything required to fulfil assurance, sign everything off with the invested parties and get ready to implement. This area is fully covered by the like of Prince2 and others, the standard framework of delivering a project. Implement the Change. Simple as That. If the previous steps have been done correctly, this should flow easily. Ok implementation is usually the hardest part and we know that, however if all the ground work has been done as stipulated above, things should flow fairly fluidly. Of course that all depends on the people involved. Evaluate, Evaluate, Evaluate, Of all our standard change steps “Foundation, Plan, Implement, Evaluate”, Evaluate is the area which is done the worst Most don’t do Evaluate, but nearly all will try to evaluate, and in the worst cases fail dismally. It is usually done so badly because the benefit in the first place was so broad and/or ill-defined, and no baselining was ever done meaning there is no understanding of potentially what the benefit was specifically and/or no idea of what it was like in the first place. 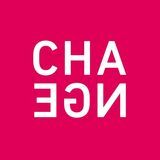 Getting Change right in an organisation should deliver value with minimal resource, and this is everything we hold dear at Change. We’re quite happy to answer any questions via E-mail or you can read more thoughts now.